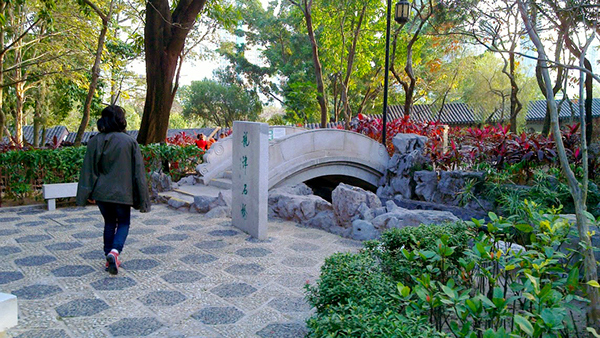 Upon my first visit to Hong Kong with my wife Edelweiss in 2014, I fell in love with her city. Later that year, the same streets in which we walked hand-in-hand were occupied by protests against the increasingly pro-Beijing government. The city ground to a halt as a hundred thousand protesters were subjected to tear gas and riot police abuse. Stuck in the US with friends on the frontlines a continent away, Edelweiss and I put our design skills to good use, collaborating with other Hongkongers at RIT to raise awareness among the student populace. In just under a week, we plastered up posters around campus and began to hand out yellow ribbons and ask for signatures to show solidarity with the protestors. 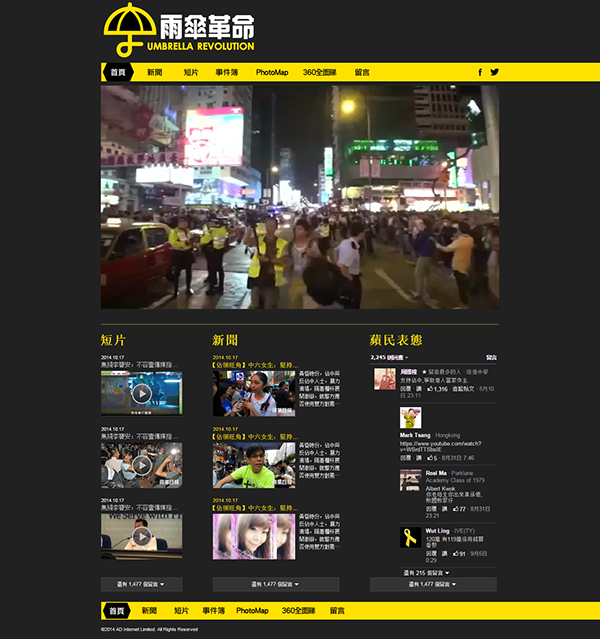 To give background to the protests, I created the animation below and shared it through Hong Kong social media and news outlets, where it was seen by tens of thousands of people across facebook, youtube, and vimeo, and was even featured on the Coconuts Hong Kong and Hong Wrong news sites! After a group of climbers/protesters hung a huge banner from Hong Kong's famous Lion Rock, I created a quick second animation to chronicle their adventures. 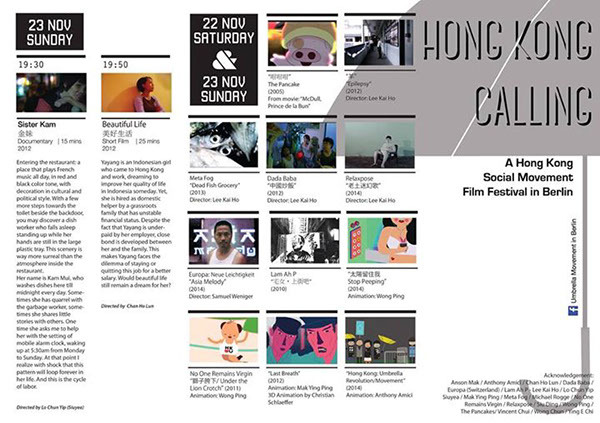 Later, I was contacted by Iris Heung, a Hongkonger living in Berlin who wanted to use my animations in an exhibition and film festival, Hong Kong Calling. In under a week, I made another short animation below, specially for her festival. I met up with Iris when I was in Berlin in 2015 and she told me that reactions were positive and my animations brought a bit of humour out among the many darker films. 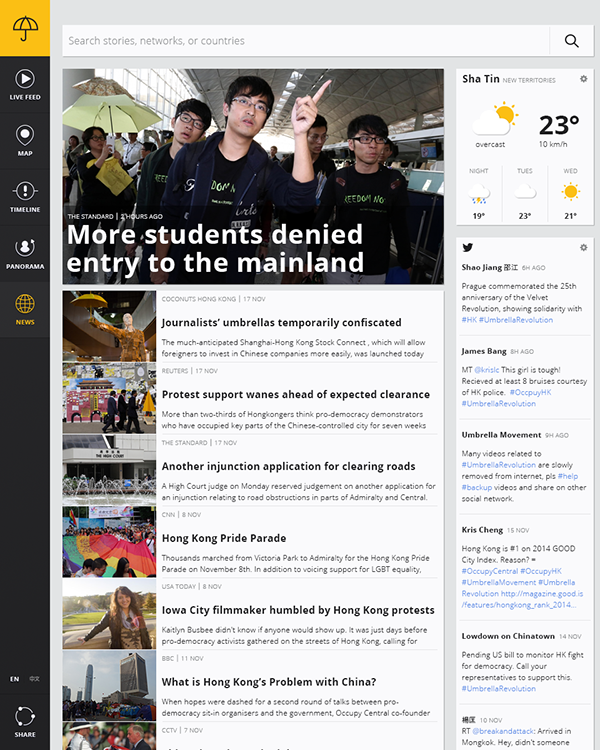 Edelweiss and I often followed live feeds of the protests on the Apple Daily news site, so I used this as inspiration for my UI design class and made a concept of an improved layout for a live stream and a news aggregator web app. 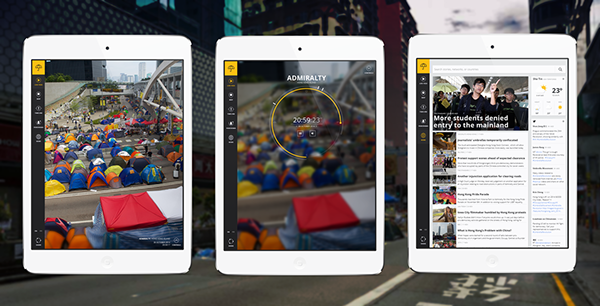 The most vital information to display is the current live feed, so that is what greets the user on the home page. 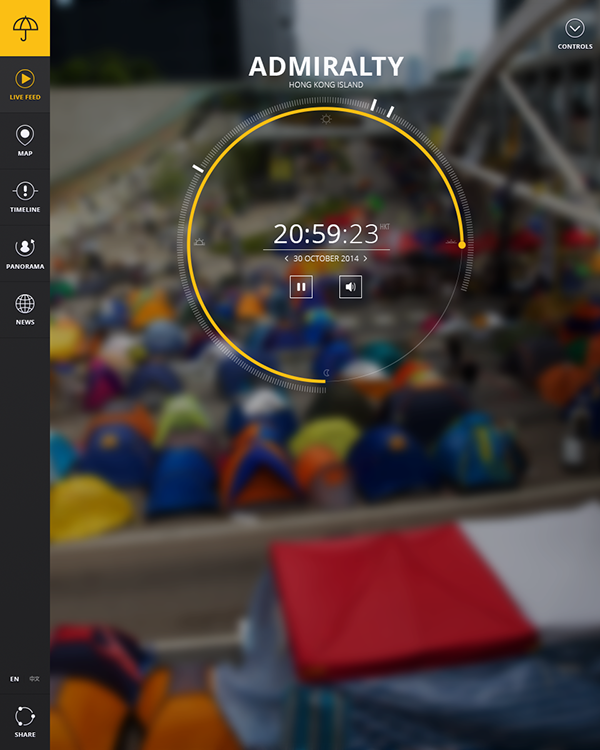 I loved the concept of Pharrell Williams' 24 Hours of Happy music video, so I adapted its circular timeline to allow users to scrub back to marked important points earlier in the day. The news page lays out the stories in a much more open, infinitely-scrolling view, with the most current or most important called out at the top. Twitter was commonly used to report real-time on the protests, so I included an auto-updating feed on the right of the page. 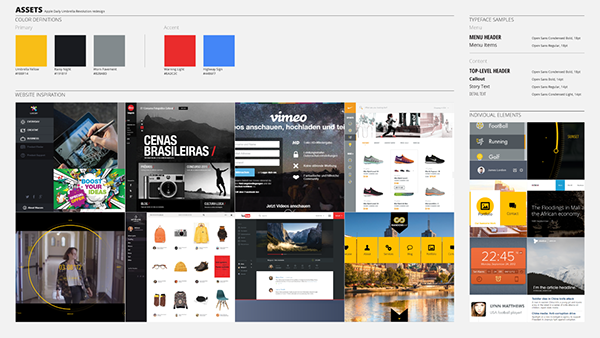 I am amazed that I was able to reach so many people with my design and animation. Both at RIT and through the internet, I got to know many people I would not otherwise have met and hopefully helped and informed many more. Despite the lack of political progress brought about by the Umbrella Revolution, much social progress has been made, with more and more of the younger generation involving themselves in politics in Hong Kong. 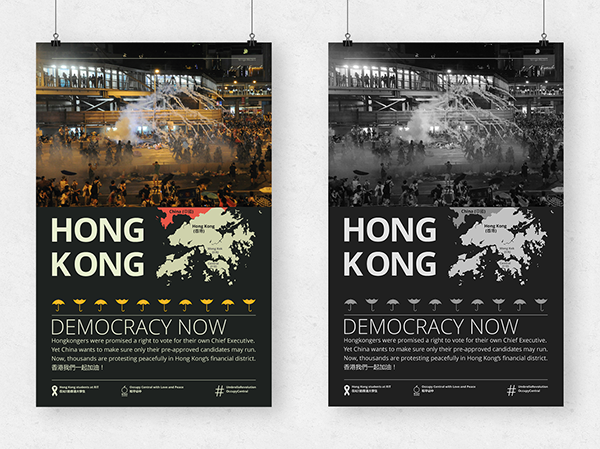 Furthering political and social revolution in Hong Kong through design.